Fun at the Flat Iron in Wicker Park! 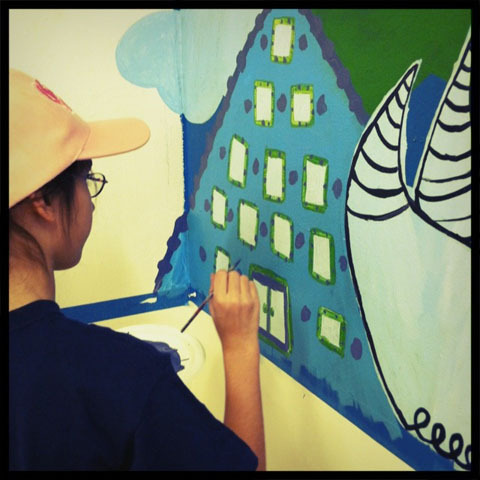 Teen artists from Right-Brained Studio are working on a 4′ x 10′ mural for the “Now…” Show at the historic Flat Iron Arts Building in Wicker Park, Chicago. This is our 3rd year participating in this annual event and we are excited and honored to be a part of the fun. The show’s unveiling will take place on Friday 4/6 with an opening reception from 6-10pm and on Friday 5/4 with a closing reception from 6-10pm. Please show your support for our studio’s artists as well as view the work of local professional artists during the event. Please contact the studio for more details. “Three” great art shows in one! Youth Artists Daniel, Sebastian, Frankie and Katie attend their art opening! Thanks to all who attended “Three” an art opening reception for the Self Gallery class at WSMS, the Button Show and Art Space teen artist series exhibition on Friday December 9th! 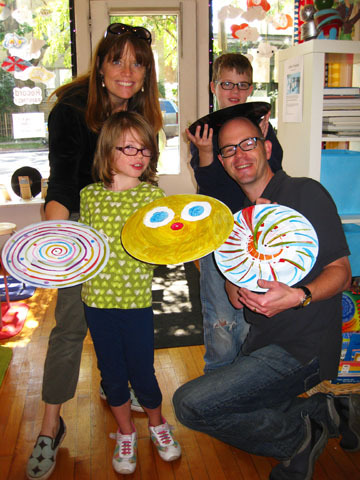 The studio was filled with art, youth artists and their families. Please check out our Photo section to see the artists’ work. Celebrate Art! Create a special event at Right-Brained Studio! 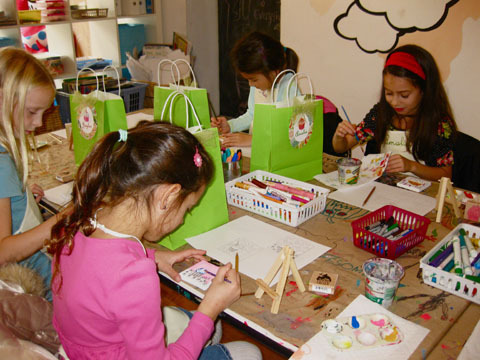 Amalia celebrates her Birthday with friends by creating cupcake paintings on mini-canvasses and easels! You can customize your own art celebration at Right-Brained Studio! 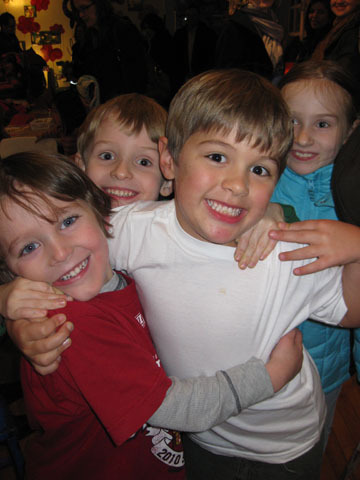 Get a group of friends, family or both together, bring your Scout troop or plan your next Birthday celebration to incude a visit to the studio. Stay anywhere between 1-2hrs and work on an art project all your own. Some ideas include sewing, painting, sculpture, comics and more! Tuition is between $10-$20 per participant depending on the project, materials and time spent at the studio. Thanks to all those who participated in our studio events during Art on Harrison! The Cissold Family with their "Rad Records"! We had a great time both Friday night and Saturday afternoon as artists of all ages came to the studio to make something! Artists inspired each other to draw, paint, collage and more on paper as well as on vinyl records (Some young artists referred to them as “big discs”). Teen artists Monica and Teagan brought in a record player and acted as dj’s during our Rad Record painting event. Chicago artists Eric Bartholomew and Kat shared their mini record player with us to spin records on while artists painted on them, bringing a whole new approach to “spin art”! The creativity never ends at Right-Brained Studio! Right-Brained Studio FREE Events during “Art on Harrison” Friday 9/16 – 9/17! 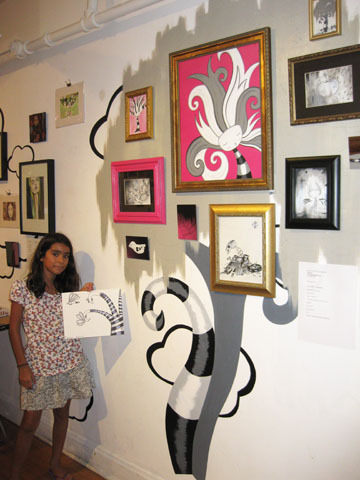 Youth Artist Caroline, age 11, is inspired by the art on the walls at Right-Brained Studio, during "The Candy Store" Pop-Up Gallery Art Show. Join us for a weekend of FUN at Right-Brained Studio! Right-Brained Studio will extend “The Candy Store” Pop-Up Gallery Show for this weekend only! Gallery Hours from 6-10:00pm. Art materials will be available to use, so come on in and be inspired to make your own masterpiece. This event is free and open to the public, all are welcome! Saturday September 17th from Noon-2pm. Be inspired by Czr Prz, Chicago artist, who painted a 20 record installation up on our studio walls or create your own design! Records, paints and space are available on a first come first served basis, while supplies last. All materials are included, but prepare by wearing your art clothes and bring a box or bag to transport your art to your home. This event is free and open to the public. All ages welcome, artists under 14 must be accompanied by an adult to participate. Come by and see “The Candy Store” Pop-Up Gallery at Right-Brained Studio! The art is up and ready for viewing! Stop by during our special gallery hours, come to our opening reception and/or sign up for a “$15″ Artist Inspired Workshop! 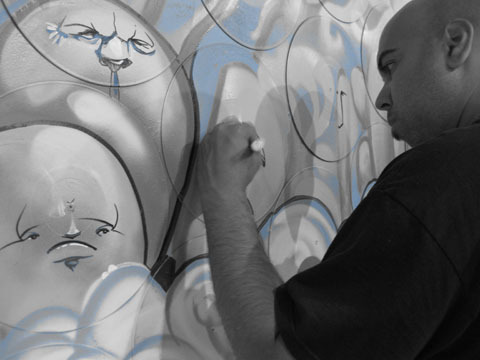 Participating Artists: John Airo, Blutt, Mindy Fisher, Brandon Garrison, Ben King, Graciela Llorente, Niaomi Martinez (monstrochika), Kelly D. Pelka (paranoidgirl), Czr Prz, Deva Suckerman and Craig Taylor.